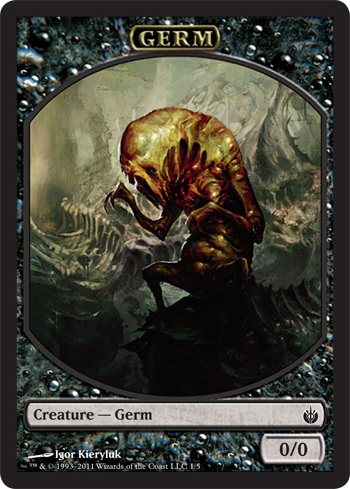 and all through the Arcane Lighthouse, not a creature card was stirring, not even a Germ. 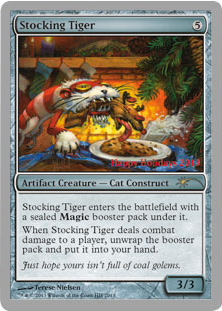 The Stocking Tigers were hung by the chimney with care, in hopes that Mark Rosewater soon would be there. The Children of Korlis were nestled all snug in their beds, while Visions of sugar-plums danced in their heads. And Mother of Runes in her 'kerchief and I in my Jester's Cap, had just settled in for a long Winter's Night nap. When out on the roof there arose such a clatter, I sprang from my bed to see what was the matter. Away to the window I flew like a Flash, tore open the shutter, and threw up the sash. The Blood Moon on the breast of the new-fallen snow gave the luster of midday to objects below, when what to my wondering eyes should appear, but an Arcum's Sleigh and ten giant dragons. With a little old driver, so lively and quick, I knew in a moment it must be Saint Traft. "Now Dromar! Now Darigaaz! Now Crosis! Now, Treva and Rith! "On, Oros! On, Vorosh! On, Teneb! On, Intet and Numot! "To the top of the porch! To the top of the Steel Wall! "Now Wipe Away! Force Away! Whisk Away all!" As dry Healing Leaves that before the wild Hurricane fly, when they meet with an obstacle, mount to the Skycloud Expanse so up to the house-top the dragons they flew, with the sleigh full of cards, and Mark Rosewater too. And then in a twinkling, I heard on the roof, the prancing and paying of each Dragon's Claw. As I drew in my head and was turning around, down the chimney Maro came with a Rebound. He was dressed all in fur from his head to his foot and his clothes were all tarnished from ashes and soot. A bundle of toys he had flung on his back and he looked like a Nightshade Peddler just opening his pack. His eyes how they twinkled, his dimples how merry! His cheeks were like Lotus Petals, his nose like a cherry! His droll little mouth was drawn up like a Heart-Piercer Bow and the beard on his chin was as white as the snow. The stump of a pipe he held tight in his teeth and the smoke it encircled his head like a Wreath of Geists. He had a broad face and a little round belly that shook when he laughed like a bowl full of jelly. He was chubby and plump, a right jolly Sunblade Elf. I laughed when I saw him in Spite of myself, a wink of his eye and a twist of his head soon gave me a know I had nothing to Dread. Merry Spoilers to all and to all a good Night.